According to a recent report from the Sun Sentinel, a Florida police dog has been fired after biting two people in a three-month period. The police K9, a four-year-old Belgian Malinois, had been with the police department for around a year prior to these two biting incidents. The first incident occurred last November, when the dog bit a police officer while he was issuing a citation. The officer was bit in the leg and suffered a personal injury. The second injury was much more serious. According to reports, the dog ran out of his handler’s car and into a local doughnut shop. When this dog entered the shop, he immediately bit an employee’s calf, causing serious damage. This injured worker has hired a lawyer to represent him in his dog bite case. Witnesses say the dog and his handler, a police officer, went to the doughnut shop to meet a police sergeant. Police sergeant started to pet the dog that was in the back seat of a patrol car when the dog lunged at her. Dog’s handler warned the sergeant to back away from the car while he was struggling to restrain his dog. He tried to unbuckle his seat belt, when he lost hold of the leash, and the dog bolted from the police car. Handler called the dog’s name three times, and gave a command to stop, but the dog started to chase another police officer in front the doughnut shop. Before reaching the other police officer, the dog changed directions and ran after a 37-year-old employee who was reaching for his apron. It took about a minute for the dog’s handler to control the dog, and, in that time, it allegedly bit employee four times. He had three-inch long bites on his right calf and shin. The dog’s handler was finally able to pry the dog off victim, according to local police. In the Commonwealth of Massachusetts, personal injury lawyers frequently handle dog bite injury cases. One of the most important issues in these types of cases is whether or not a dog owner knew or had reason to know his or her dog had a propensity to bite. Essentially, unless a dog is a breed known to be dangerous, such as pit-bull or Rottweiler, a dog owner generally does not know his dog is likely to bite someone the first time it happens. 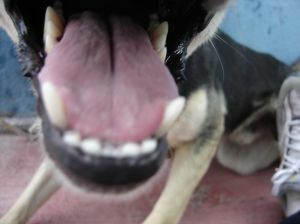 If a dog has previously bit someone, and the owner allows the dog to bite another victim, he or she is said to be on notice his or her dog was likely to bite someone and may be negligent. This is known as a “dog gets one free bite rule” when taught to law students. However, in reality, a dog owner may be liable even the first time his or her dog attacks someone, especially in the case of a dog that is actually trained as an attack or guard dog. This same law applies to most other domestic animals when someone is bitten. In the case of exotic animals or livestock, owners may have even less protection from liability.